Newly opened in fall of 2013, the Hyatt Centric Times Square is perfectly situated on 45th Street off the 6th Avenue business corridor and alongside Manhattans Theater District. Within walking distance, guests will find Rockefeller Center, Bryant Park and the New York Public Library. This modern, 54-story high rise features 487 spacious, floor-to-ceiling windowed guestrooms and 49 suites. The hotels amenities include a rooftop bar & lounge offering indoor & outdoor seating, a state-of -the art fitness facility, full-service luxury spa, and T45, a diner featuring American eclectic cuisine. 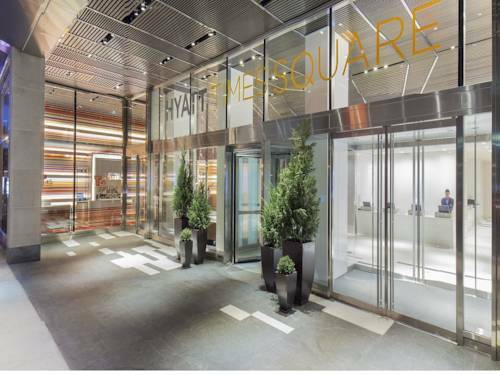 The new Hyatt Centric Times Square New York opening in Fall of 2013 boasts 487 guest rooms, including 49 suites in the heart of Manhattan's Theater District. The 54 story high rise will include a rooftop bar, state of the art fitness facility, luxury spa and a street level 24 hour Diner. Perfectly situated on West 45th Street between Broadway and 6th Avenue, this hotel provides a central location for business and leisure travelers alike. Guests will find themselves steps away from the business district and famous attractions such as Broadway, Radio City Music Hall, Rockefeller Center and the New York Public Library. T45 is a modern day diner offering farm to table, breakfast, lunch and dinner.